Guitar legend, Charlie Sheen enabler and recent Hollywood Walk Of Fame inductee Slash has announced a new series of 2012 UK tour dates set to take place this October. 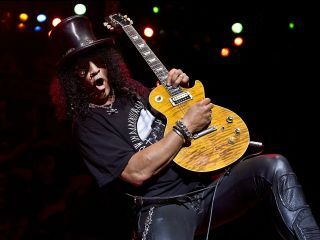 The gigs are in support of Slash's second album, Apocalyptic Love, which was released earlier this year and recorded with his touring band, Myles Kennedy And The Conspirators. Check out the full list of dates below. Tickets go on sale this Friday at 9am and will be available from Ticketmaster and Live Nation, with the exception of the Edinburgh show, which will be handled by PCL Presents.